blackbird, originally uploaded by plingthepenguin. To do proper photos like this I think I'd need a tripod, more of an idea what I was doing re focus, and more patience. The last of these probably being the stumbling block in the long term. But for all the sloppyness it's a pretty neat pic. I do hope the blackbird hasn't got a nest somewhere totally dumb - our cat may not be the greatest hunter, but there's a lot of cats around the area. 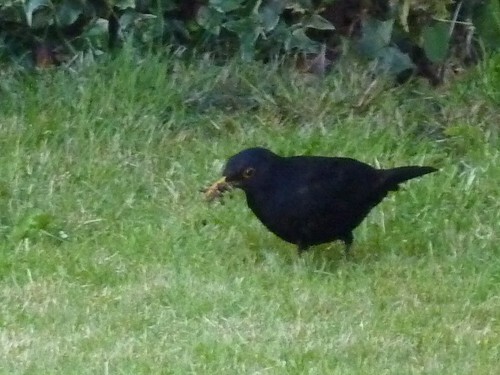 Still, for now the blackbird seems quite happy hanging out in our garden in the evenings, bobbing around the grass collecting things (mostly food, I think?). you can do clever bracketing stuff with varied exposure settings, and create an HDR image using hugin. very spiffy. having a tripod makes this easier.